When I started this I said it would hopefully develop into a blog about fitness and healthy living….some of you may yawn and move on at this point. So at the risk of being moderately interesting and breaking up the depressing posts about cancer, here is something a bit different. One of the many things I’ve added a lot more of to my diet this past year is turmeric. I have seen an increasing amount of articles on it recently, and it is a hot topic for good reasons. It has a huge amount of health benefits because it is a powerful natural anti-inflammatory, that has been used in medicine around the world for a very long time. Inflammation is the culprit for so many health conditions and illnesses. Turmeric’s anti-inflammatory effects would benefit everybody, whether you’re an athlete, just want to stay healthy or someone actively fighting a disease. The powder is most commonly used but the root can be bought fresh, just like ginger, and it tastes so much better. Just be warned, the fresh stuff stains your finger tips orange if you cut it up. It can even be bought in capsule form for convenience. But like everything, nothing beats the fresh stuff. Here are some of the benefits, that haven’t been copy and pasted………. Contains bioactive compounds and used in medicine: These compounds are called curcuminoids, the most important of which is curcumin. Curcumin is a natural anti-inflammatory compound: It is now believed that chronic, low-level inflammation plays a major role in almost every chronic, Western disease. This includes heart disease, cancer, metabolic syndrome, Alzheimer’s and various degenerative conditions. It turns out that curcumin is a strong anti-inflammatory; it is so powerful that it matches the effectiveness of some anti-inflammatory drugs. Increases the antioxidant capacity of the body: Curcumin has powerful antioxidant effects. It neutralizes free radicals on its own, and then stimulates the body’s own antioxidant enzymes. Curcumin boosts brain-derived neurotrophic factor. Linked to improved brain function and a lower risk of brain diseases: Curcumin boosts levels of the brain hormone BDNF, which increases the growth of new neurons and fights various degenerative processes in the brain. Lower your risk of heart disease: Curcumin has beneficial effects on several factors known to play a role in heart disease. It improves the function of the endothelium and is a potent anti-inflammatory agent and antioxidant. 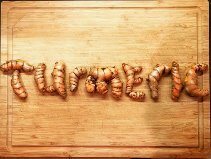 Turmeric can help prevent (and perhaps even treat) cancer: Curcumin leads to several changes on the molecular level that may help prevent and perhaps even treat cancer. Curcumin may be useful in preventing and treating Alzheimer’s disease: Curcumin can cross the blood-brain barrier and has been shown to lead to various improvements in the pathological process of Alzheimer’s disease. Arthritis patients respond very well to curcumin supplementation: Arthritis is a common disorder characterized by joint inflammation. Many studies show that curcumin can help treat symptoms of arthritis and is in some cases more effective than anti-inflammatory drugs. Curcumin helps delay aging and fight age-related chronic diseases. Lemon and Turmeric Tea; My Specialitea! Every morning I start my day with a tea which has evolved slowly over time from just lemon in hot water. It has many benefits but mostly balances pH levels in the body, reduces inflammation and helps digestion. Simply put all the ingredients in a mug and pour over boiling water. If you have some more time on your hands you can simmer it on the hob for a better taste and even add some crushed fresh ginger and turmeric. This is golden nectar and great before bed. Gently simmer all the ingredients in a saucepan for 5-10 mins. Blend all these ingredients up for a refreshing smoothie! Simply fry some freshly crushed turmeric in coconut oil at the start with your ginger, garlic, chili or whatever you usually like in your stir fry. Then add the diced chicken and lastly the vegetables. Sprinkle over some sesame and pomegranate seeds and serve over rice or noodles. Very simple stir fry, but tasty. Fresh turmeric is eggcelent with scrambled eggs! I shortly fry some freshly crushed turmeric, chopped up spring onion and chilli in coconut oil before I add my beaten eggs. And I like mine with salmon, some leafy greens and avocadoes to up the healthy fats. Season with black pepper to increase the turmeric absorption. This is a lot better than I expected and a great breakfast or evening treat. I crush about 1 inch of fresh turmeric into natural organic yogurt and mix it up. Sprinkle over some seeds, nuts, blueberries and raw organic honey. The turmeric turns the yogurt a great shade of orange! 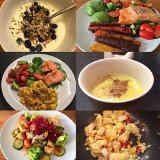 Quickly sauté any veg you want, here I used rainbow carrots, in butter or coconut oil and freshly crushed turmeric. Squeeze over half a lemon and serve!